Increasingly, European countries are banning wild animals from circuses. 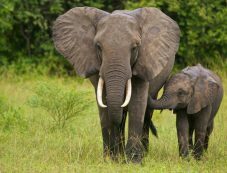 These include over 100 elephants, and relocating them to their country of origin is not always possible. That’s why Elephant Haven decided to create a refuge, located on 28 hectares of land in southwest France, for the pachyderms to retire and spend the rest of their lives. You can support the refuge through the American Friends of Elephant Haven – European Elephant Sanctuary.